The Impact² World Award recognises start-up and small-scale companies who aim to tackle significant social and environmental issues. The Hong Kong Edition – which was organised by the Jockey Club Social-Tech Incubation and Youth Entrepreneurship, ‘So In So Good’ Project – was held this Tuesday at start-up co-working space Campfire in Kennedy Town. Ten pre-selected start-ups had the opportunity to pitch their initiatives in front of a panel of judges in the hope of winning one spot in the finals, which will be in March next year during the Impact² World Forum held in Paris. Around 1,500 business leaders, policymakers, financial institutions, and other organisations are expected to attend the event, along with the Mayor of Paris, Anne Hidalgo. Some of the notable features at the HK Edition included NO/W (which stands for No-Waste), an upcoming online platform which will sell sustainable products to reduce everyday waste; Livin Farms, who are commercializing the world’s first desktop hive for home-grown edible insects; and The Brightly Project, an innovative platform where teens can privately ask anything about their mental health and get adapted support and advice through a video response from positive role models. 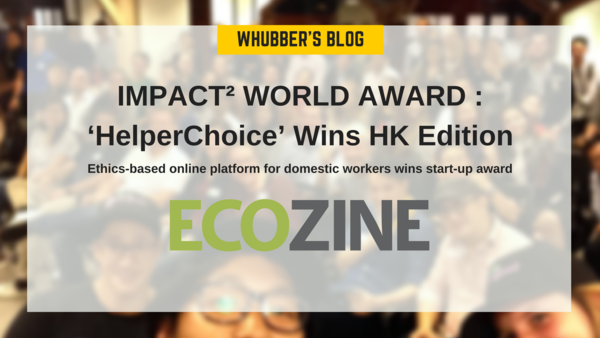 Amongst these brilliant initiatives and others, the selected winner was HelperChoice, a platform that helps migrant domestic workers and employers to connect online. Their mission is to make the hiring process more ethical and fair for workers and more efficient and tailored for employers. The platform is free for domestic workers and allows them to conduct mutual interviews with prospective employers. Workers can upload profiles onto the site, detailing their experience and skills. On their end, prospective employers can filter their searches using a range of criteria, including availability, experience, skills, among many others. This means domestic workers can start their jobs without having to take out loans to pay excessive and often illegal placement fees, while they are also able to find employers with whom they are a good match. The service is available in different locations in Asia and the Middle East and has already seen some huge successes. Indeed, since its launch in 2012, HelperChoice has facilitated more than 7,000 matches – meaning an estimated US$8.5m in illegal placement fees has been avoided. Anyone who has lived in Hong Kong long enough has heard heart-breaking stories about the stresses and abuses domestic workers can face, so we congratulate Fauchon on her remarkable initiative and wish her all the best representing HK in Paris next year. To find about more about HelperChoice, visit their website or follow them on Facebook.